Detective Sergeant Jamie Brooke is assigned to a murder investigation. As Jamie Brooke begins to investigate the murder of a young heiress, she stumbles into a world of freaks, pain, suffering and macabre pleasure. Jamie is a tough woman but has a beautiful heart and is hanging on to her only child by a thread. Her world is turned up-side down as she actively pursues leads in this case of genetic engineered monsters. To solve the mystery of the murder and find something extremely precious to her heart, she enlists the help of a reluctant Psychometry Clairvoyant, Blake Daniel. Blake Daniel is fabulous male character who has suffered in life for the 'gift' that his special form of clairvoyance brought to him. Together they cross boundaries, delve into a macabre world of stolen corpses, body modification and insane genetic engineering of monsters. This thriller had me on the edge, I had to know what would happen. I listened to the audiobook, written by British Author, J. F. Penn and narrated by Rosalind Ashford. Rosalind Ashford brings many years of expertise in voice acting to the audiobook version. She brings the characters to life in a vivid way. I laughed out loud at certain points in audiobook. I also sobbed through chapter 14. I can't reveal what happens in this chapter because I do not want to spoil it for you. But, this was a fantastic chapter for me and I was deeply invested in the story, Jamie Blake so much more to me than a character. I also found myself grimacing and blanching as I listened greedily to this thriller. If you enjoy thrillers, paranormal, suspense and mystery, then you may enjoy this work as much as I have. I thoroughly recommend it. Audiobooks are a great way to engage in a story while doing other tasks. I particularly enjoy listening to audiobooks on the train to and from my day job, and also in my car. 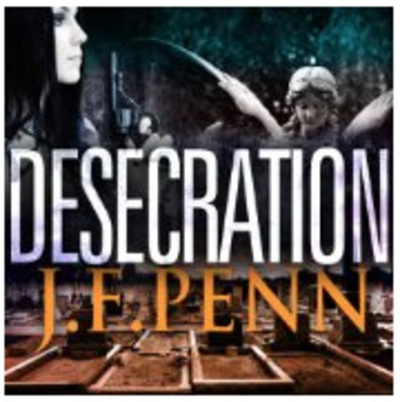 If you want to read or listen to Desecration by J. F. Penn, you can visit her website, The Creative Penn to find out more. This and many other titles written by J. F. Penn are available in e-book, through traditional print publication and on audiobook. Many of Joanna Penn's titles are now being translated into other languages. Make sure you check out J. F. Penn to get your thriller fiction fix!